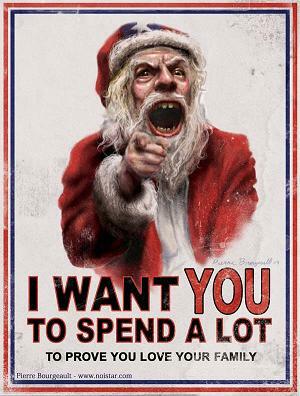 To many individuals, the sentiment expressed in this poster is Christmas. Maybe they dislike it, maybe they resent it, maybe they regret it, maybe they long for something different. Or maybe they buy into it. Both literally and figuratively. The old saying goes, "Time is money." It's not true. Beyond estimation, time is worth more than money. This Christmas and all throughout the year, spend time with those you love. With your wife, your husband, your children, your friends. No gift(s), no matter how lavish, can take the place of that. And as for love: tell them so. Look them in the eye, and say, "I love you." Almost nothing says it better than that. Since time immemorial.